This review originally appeared in 2010. The Cap'n makes no effort to hide my love for Tales from the Darkside, a staple of USA's Up All Night and horror anthology show that frequently gave me the creeps in the wee hours of the morning. After Season Three arrived on DVD two weeks ago, a set that contains quite a few of my favorite episodes (including The Circus, The Geezenstacks, Seasons of Belief, and The Milkman Cometh), I realized that despite my unabated enthusiasm for the show, I'd never actually seen the movie. I blame this on a handful of factors: when it came out in 1990, I would have only been eleven and still in a phase where horror scared the hell out of me. 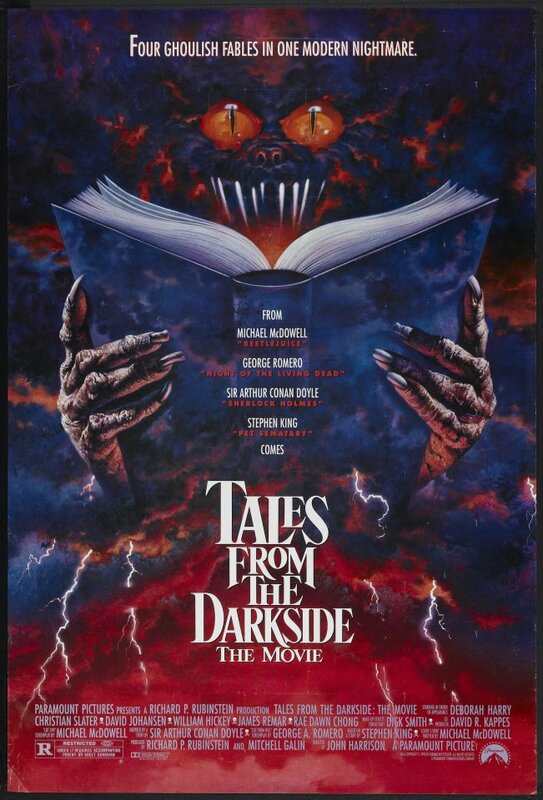 I've also rarely heard a kind word about Tales from the Darkside: The Movie (it has a 38% Fresh Rating on Rotten Tomatoes and generally seems to merit [at best] a "rent it"), so while I've seen the DVD around before, I just never bothered renting it. And let me tell you, I kind of regret that now. It's not a great movie, but it does do two things that kept me on board for 90 minutes: the anthology structure (which keeps it true to the spirit of the show) and a pretty damn good cast (also keeping in spirit of the show, if you look at the number of people who worked on the series). The structure is pure anthology: three unconnected tales wrapped together punctuated by a "bridge" story - in this instance one of a boy named Timmy (Matthew Lawrence) trying to avoid being cooked by a witch (Deborah Harry). The stories are vintage Darkside: a killer mummy doing the bidding of a meek college student; a deadly cat threatens an eccentric millionaire and a hit man; a gargoyle spares the life of an artist - but at a price. I've read in a few places that Tales from the Darkside: The Movie fails to really take the TV show forward into a cinematic presentation, but I'm not really sure that's the point. While it's true that it sticks to fairly limited locations with small casts and limited (although at times pretty good) special effects, broadening the scope isn't really going to do anything but make Darkside like any other anthology film. One of the strengths of the show was the fact that it had a limited budget, and within that they managed to foster a sense of dread and claustrophobia for the stories. There is "no escape" for these characters, and in some ways I think that the movie does replicate that nicely while still benefiting from higher production values. The cast is also more interesting to me now than I think it would have been twenty years ago: at the time, I supposed that Christian Slater (Heathers, Pump Up the Volume), Deborah Harry (Videodrome, Hairspray), and Rae Dawn Chong (Commando, Soul Man) would have been the big "names" for the film, but the movie also features James Remar (Dexter, Ratatouille), David Johansen (Scrooged, Married to the Mob), Julianne Moore (Boogie Nights, Far from Heaven), Robert Klein (Primary Colors, Jeffrey), William Hickey (Wise Blood, Prizzi's Honor), Mark Margolis (Breaking Bad, The Fountain, Oz, and oh, a dozen other things you've seen) and Steve Buscemi (I shouldn't even need to tell you). It's a nice combination of well known character actors - some of whom were on the show - and up and comers that would be better known later. The stories are pretty good too, particularly the last one ("Lover's Vow"). Even if you can figure out the "twist" (and it really isn't that hard), there's a surprising poignancy I wasn't expecting from a low budget horror film. The first segment ("Lot 249," based on an Arthur Conan Doyle story) is also nice, although it relies pretty heavily on arcane explanations of scrolls and translations that dull the last "shock" a little bit. What it lacks there, it makes up for with solid performances from Buscemi, Slater, and Moore and some inventive mummy kills. If there's a weak link, it may be the too-long-for-it's-own-good middle section (Stephen King's "Cat from Hell", adapted by George Romero). It's not that "Cat from Hell" isn't interesting in its own way, it's just that the story is broken into two sections: Millionaire Drogan (Hickey) relating the story of the cat to Hit Man Halston (Johansen), and Halston stalking the cat in a mansion with almost no lightning. The first half sets things up nicely, and you can tell that Romero's relationship with King on Creepshow had some effect on the flashback structure (while Romero didn't direct the film, I strongly suspect the use of a deep blue to indicate "flashback" came from the same comic-book formula used in Creepshow). The problem is that once we get to Halston hunting the cat alone, it's pretty clear what's going to happen, so the drawn out hunting gets a little repetitive. It's saved by what may be the grossest gore effect in the entire film (involving the cat crawling into Johansen's mouth, down his throat, into his stomach, and back out), but by the end it's almost too little, too late. The wraparound story starts out strongly - with Timmy in a cage trying to prevent a very modern witch from cooking him in her suburban oven - but fizzles out at the end by trying to not play into Darkside audience expectations. It's not the best way to end the film, especially after a great third act anchored by Remar and Chong. Gripes aside, I still don't quite understand why people dislike this movie so much; it's closer in spirit to the show than either Tales from the Crypt movie (and to some degree, the earlier anthology version Amicus put out) and considering that it's competition in that era was Campfire Tales, Creepshow 2, and Grim Prairie Tales, I'd say Darkside works better as an anthology movie. 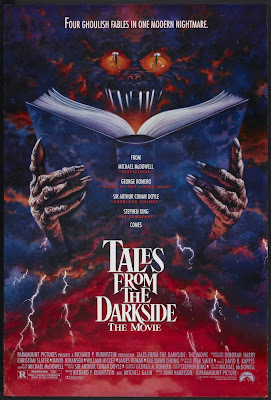 The genre is probably better known for having a lot of "good" entries and only one or two really "great" films, and I'd certainly say that Tales from the Darkside: The Movie is on the same page as The House that Dripped Blood, Asylum, or Trilogy of Terror. It's probably better than Cat's Eye, Quicksilver Highway and Twilight Zone: The Movie, if not up there with Doctor Terror's House of Horrors, Tales from the Crypt, or From Beyond the Grave. If you like the show, then the Cap'n feels like you'll appreciate the step up in production value of Tales from the Darkside: The Movie, especially because it doesn't stray too far from what made the series work. The film has a good cast, limited - but impressive - gore, and two of the three stories were better than I expected they'd be. So count me as one of the 38% that's "for" Tales from the Darkside: The Movie; it worked for the Cap'n.